After our successful first Spokane tour, we were hooked! 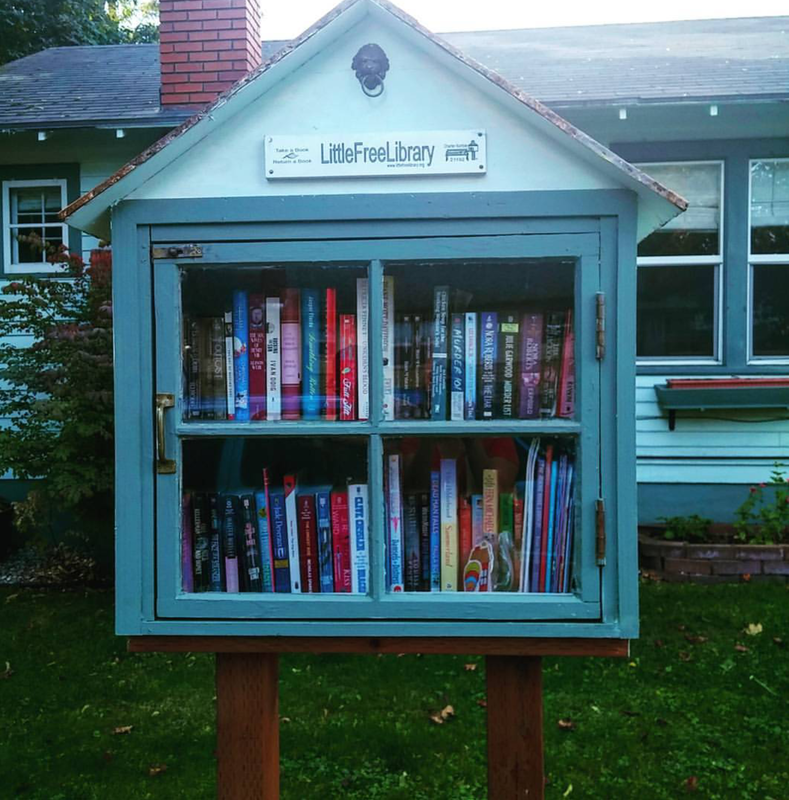 Back we went at the end of September for a new round of Little Free Libraries and we weren’t disappointed. This time BOTH of my sisters joined me, and my son was once again our driver. And the heavens smiled on us with another beautiful day in the Inland Northwest. 1st Stop. 1903 W 10th Ave. This library was a nice surprise—it was a happy unexpected accident that we spotted it. I must have missed it on the LFL map, because it wasn’t on my list. I left a fun book called Patty Jane’s House of Curl by Lorna Landvik, and I took a book for my sister—Julie and Romeo by Jeanne Ray. Looks good. 2nd Stop. 1917 W 8th Ave.
A quick stop to at the Patsy Clark Mansion designed by architect Kirtland Cutter in 1897. At one point this building used to be a restaurant and both my sisters were lucky enough to have been there together. 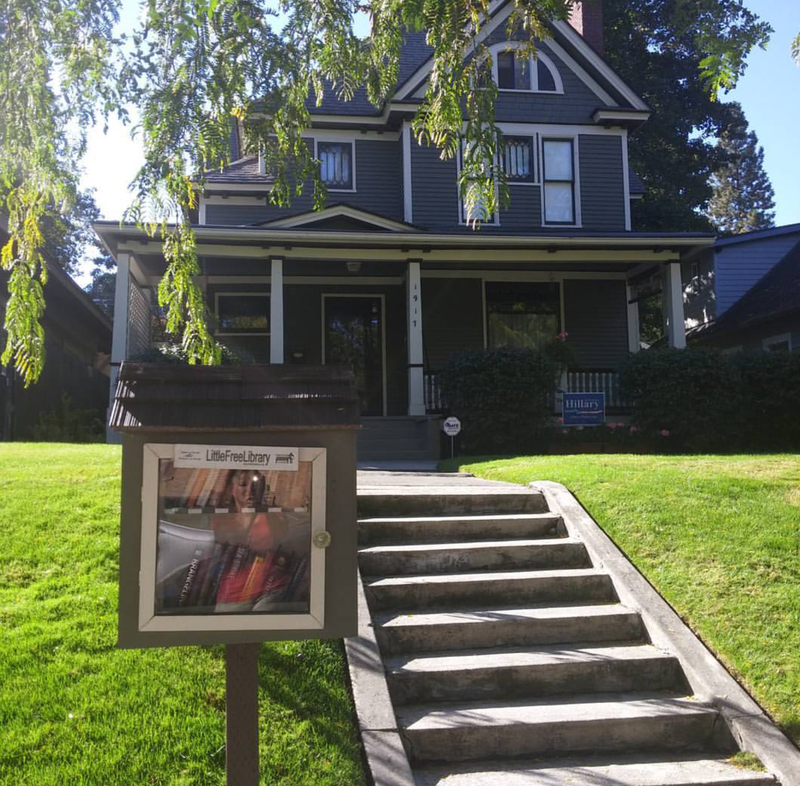 Right across the street is Coeur d’Alene Park, the first park in Spokane built in 1891. Look at that copper-topped gazebo! Patsy Clark Mansion and Coeur d'Alene Park, Spokane, WA. 3rd Stop. 2017 W Pacific Ave.
At this library in the Browne’s Addition I found a book for my granddaughter, The Legend of Sleeping Bear by Kathy-jo Wargin. Illustrated by Gijsbert van Frankenhuyzen. I left a good one that should get snatched up right away. What She Knew by Gilly MacMillan was one of those books that was hard to put down. And guess what? 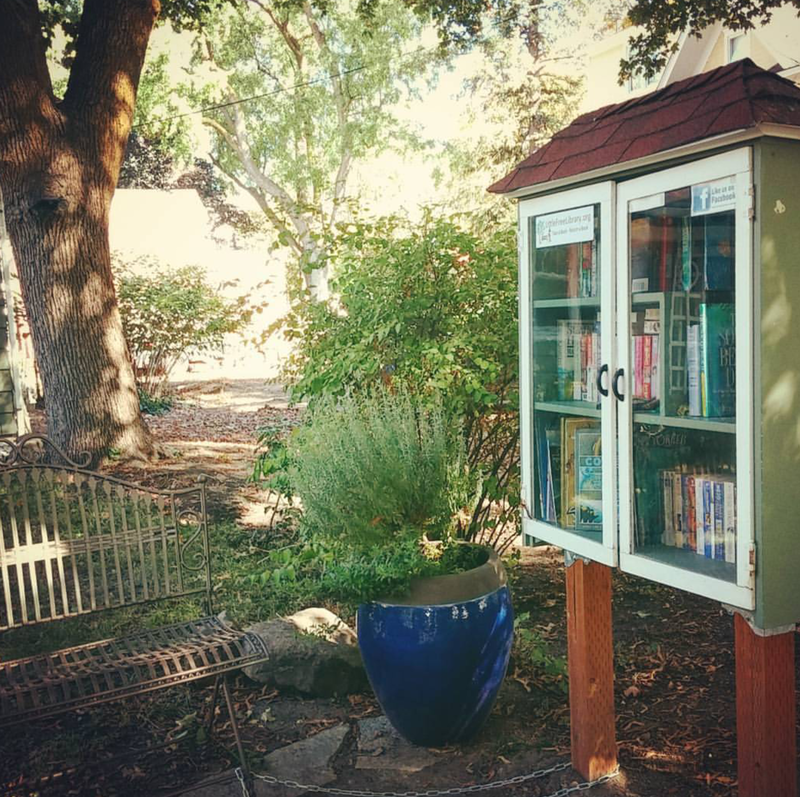 This library was right by Browne’s Tavern—lunch time! Portobello Mushroom Sandwich, Yummy Cheesecake, Bloody Mary! 4th Stop. 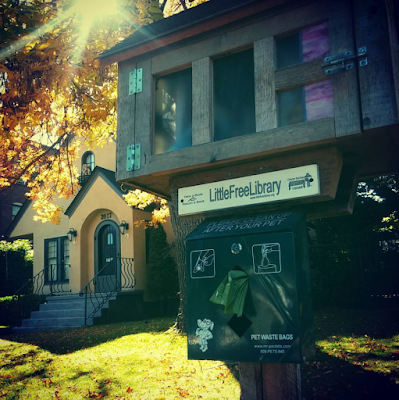 2414 W Pacific Ave.
We were back on tour and just look how welcoming and wonderful this Little Free Library is! It’s like a little book paradise. They have a bench next to a potted plant, ready for you to sit right down and start reading. Of course I wouldn’t do that with the others waiting for me, but it sure was tempting. I couldn’t believe my luck, when I found the most beautiful children’s book—a hefty, full-color book overflowing with all of Disney’s classic stories made into movies from Snow White to Cinderella and more. I almost felt guilty taking it. I hope I don’t get a nasty-gram telling me that the book was just for display. I can tell you though that this book will be well used. I babysit my three-year-old granddaughter twice a week and right before nap time, we jump on the bed piled with stacks of books from which she chooses what I should read to her. She LOVES books! Most of the time, I wear out before her and find my eyes crossing and my words slurring while I fight to stay awake during the fourth book or so. She loved this Disney book the moment I brought it home! 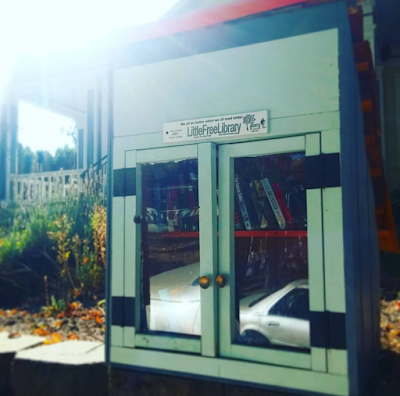 I left two books at this Little Library—a kid’s book called Rule of Three by Megan McDonald and a book I thoroughly enjoyed—The Shadow of the Wind by Carlos Ruiz Zafon. 5th Stop. Belt and Sharp Ave. 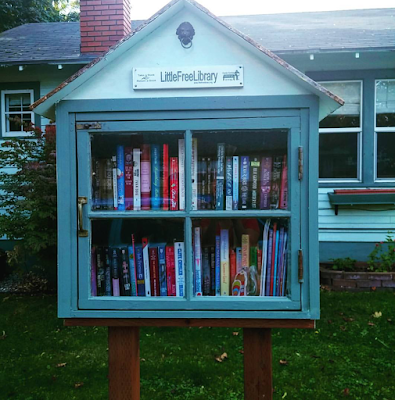 This well-stocked library was tucked away in a neighborhood north of downtown Spokane. I spotted Haus Frau by Jill Alexander Essbaum and left Still Life with Chickens by Catherine Goldhammer. One of my sisters and I both read it and liked it. Hard to let books go, but I have to make room for new ones. Our final stop of the day was in the Audubon Park area with well-kept beautiful homes all around. Here I found another treasure for my granddaughter—The Midnight Fairies by Ronne Randall; illustrated by Maddy Bell. I hope these people have a sense of humor, because I left an amusing (though sometimes rough) book club selection entitled I’m Down by Mishna Wolff. As a side note: my husband had recently read it and liked it, too. Well, that’s it for today—another awesome tour! Thanks again to the stewards who make it all possible. I imagine that this was not the last of our tours. We’ll keep hunting, probably a little north of downtown Spokane. Feel free to pass on restaurant or sight-seeing suggestions! Missed my other tours? Check them out below.